Top floor spacious 2 bedroom apartment can be found In the Concorde building behind the Medran Ski Lift (70m) and approx 6 mins walk to Place Centrale. There is a ski locker downstairs, undercover parking for one car, access by stairs or lift to top floor. Shared sauna on the ground floor. Shared hallway, entrance area with hooks for ski kit, bedroom with Austrian twin (two beds together) fitted cupboards, bedroom with single bed and single full sized sofabed bed fitted cupboards, bathroom with wc, basin and bath with shower over, living room with comfortable seating area, TV, CD/DVD player, wifi, iPod dock, open fire, dining area, well equipped kitchen area with dishwasher, fridge/freezer, conventional oven with microwave option, hob, fondue set, raclette set, kettle, toaster, large picture window and door to sunny balcony with outdoor chairs and table. Small children would need to be supervised on the balcony at all times. This is a no smoking apartment. Pets are not usually allowed please check before booking. The £250 deposit that is added to the quote is refunded 7 days after check out. We live in the country in Suffolk. Hobbies include riding, walking the dog, skiing, tennis and seeing friends. 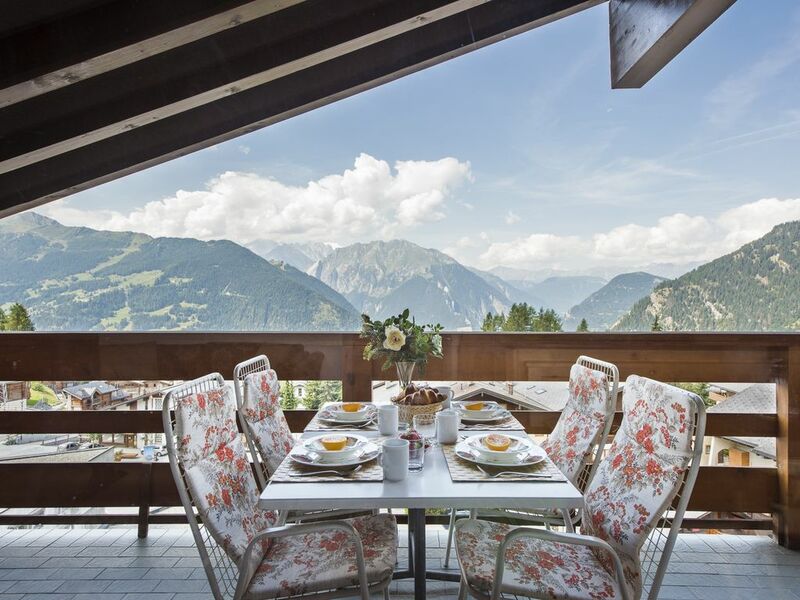 Having spent many ski seasons in Verbier I jumped at the opportunity to purchase this apartment. Being so close to the lifts and having such a superb view I was hooked. My husband and I escape here when we can, both in winter and summer. The view is exceptional - being on the 5th floor makes you feel on top of the world. It is so close to the lifts you can almost go down in your dressing gown to check what is open. 1 bathroom with bath, shower over the bath, basin with vanity unit, WC. Living room with dining area consisting of table, bench and chairs. Seating area with comfortable chairs, CD/DVD player, TV, iPod dock, wifi, open fire, large picture window, door to large sunny balcony with chairs and table. Kitchen area, with hob, oven with microwave option, kettle, toaster, fridge/freezer, dishwasher, fondue set, raclette set. The apartment is just behind the Medran Ski Lift (the main lift in Verbier). Giving access to the world famous ski area of the 4 valleys renowned for off-piste and challenging runs, as well as easy access to the gentler slopes for beginners and intermediates. Golf can be played in the summer months, the course is less than 1 mile away. Notes on accommodation: Children's equipment can be hired locally. Outside: Sunny balcony with table and chairs. Cleaning / Towels / Linen / Maid service: Included one set of bed linen and towels per person are included; final clean is but if the apartment is not left tidy money may be deducted from the deposit; Tourist Tax. Other: Ski locker, covered car park. We loved our stay in the apartment. The best was the afternoon sun and view from the balcony. Perfect location to the Medran lift. It was a pleasure to have you and the family to stay at Concorde 537 and thank you for your top review. We are delighted you had a good time and enjoyed the balcony. We love it too as it feels like you are on top of the world, quiet, yet a stone's throw from all the action! We hope you will be able to return sometime in the future. The apartment is perfect for a stay in Verbier and the location is hard to beat being right by the Medran lift but just back from the main street where all the noise and party action is (although also close enough to jet involved!). Melissa was a wonderfully helpful and considerate host as well. Will definitely book here again. We are really pleased that you enjoyed your stay in Concorde 537. Thank you for taking the time to write such a great review. We look forward to welcoming you back sometime soon. 5 Star Location: 50 metres to the Medran lifts and a breezy stroll down the hill to shops, bars and restaurants. The top floor apartment has fabulous views of the valley and mountains. The apartment is cosy and well equipped: our family of four thoroughly enjoyed our stay here. Great Value stay. Thank you so much Richard for taking the time to write such a 5 star review. We are delighted you enjoyed your stay and we would love to welcome you back anytime. Fabulous apartment, the location and views were wonderful. I am delighted you enjoyed your stay at concorde 537 and thank you so much for taking the time to write such a lovely review. Just back from our second trip to Verbier in a month-the apartment was in a good location and had everything we needed to self cater. The balcony was lovely as the weather was so warm we were able to eat outside and enjoy the great view. Melissa, the owner was very helpful and gave us some good tips to save money in Verbier. We used a catering company called Shepperds Pies who delivered a caserole to the apartment -which proved much cheaper than eating out and was delicious. We would definitely stay here again. Perfect location - compact but functional ! We stayed in the Concorde apartment as a family of 4 over New Year for 5 nights. As a skier the location could not be better - just steps away from the Medran lift and bus stop to other parts of the resort. The views from the open plan lounge and balcony are stunning - on a clear day you can see far reaching views of the Alps. The apartment maintains its 1970's styling (part of its charm!) - which the kids found amusing, like the brown tiles in the bathroom! - but everything was in good working order, the beds were very comfortable and the kitchen was well equipped. All in all an excellent choice if you don't want to walk very far in your ski boots ! Thank you so much for taking the time to write such a lovely review about Concorde. We are delighted that you and the children had such a good New Year and enjoyed your stay. Fly to Geneva (170km) then either hire a car approx 1.45-2 hrs or take the train to Martigny then either St Bernard Express train to Le Chable and get the Telecabine up to Medran or take a taxi for some or all the way. There are also shared or private transfers from the Airport to Verbier. Ferry or Eurotunnel then drive - there is a car park space with the flat. Booking Notes: 50% deposit taken if booking greater than 10 weeks away. Balance due 10 weeks before departure. Tourist tax will added to the balance once guest numbers and ages have been confirmed. Damage deposit will be required 1 month before departure. Changeover Day: Sunday is preferred changeover day but I am happy for short bookings minimum 3 nights.